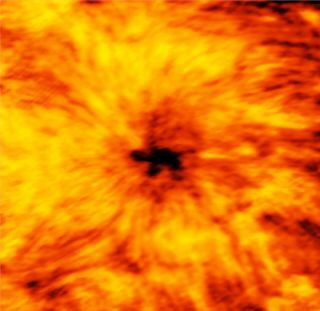 The ALMA radio telescope captured this image of a large sunspot Dec. 18, 2015, taken at a wavelength of 1.25 millimeters, which reveals the blazing-hot chromosphere located just above the photosphere (the sun's visible surface). The darker areas are cooler, including the sunspot that is nearly 2 times Earth's diameter. A shadowy turtle twice the size of Earth swims across the sun in new images from the ALMA radio telescope in Chile, viewing the sun for the first time and documenting the area right above its visible surface. The sprawling ground-based telescope is more usually used to probe radio waves released by some of the universe's most distant galaxies. In this case, though, it picked up waves released by the sun's chromosphere, which is the area just above the surface you see in visible light. Images returned by detecting radio waves at 2.5 and 3 millimeters show conditions at two different chromosphere depths — and the new views could lend more insight into the sun's physics. "We're accustomed to seeing how our sun appears in visible light, but that can only tell us so much about the dynamic surface and energetic atmosphere of our nearest star," Tim Bastian, an astronomer at the National Radio Astronomy Observatory in Virginia, said in a statement. "To fully understand the sun, we need to study it across the entire electromagnetic spectrum, including the millimeter and submillimeter portion that ALMA can observe." The large sunspot, imaged at a radio wavelength of 3 mm. This image shows a layer of the chromosphere higher up than the last, obscuring the sunspot's distinct shape. ALMA's antennas were specially designed to accommodate looking at the fierce light of the sun, according to a European Southern Observatory (ESO) statement, but this was the telescope's first foray into measuring the orb's radio emissions. It is the first observatory with ESO as a partner that can investigate the sun. Sunspots develop on the sun's surface when its magnetic field lines warp and poke through the surface of the plasma, creating a cooler area. That magnetic activity can also lead to solar flares and coronal mass ejections that send the sun's material flying outward. A full map of the sun at 1.25 mm wavelength taken using the ALMA telescope using a "fast-scanning technique" that uses only one of the observatory's 66 antennas, creating a low-resolution map of the disk in a few minutes.